Welcome to Issue 9 of The Edge of Service™ Newsletter. You are receiving this new newsletter as a friend or colleague, or because we've connected or interacted on service topics. If you choose, you can unsubscribe by clicking unsubscribe. I don't care for queues. And based on the research, it's a pretty safe guess that you don't either. As I worked on this issue during a recent business trip that took me through several cities, divine humor was at work. I ran into delays at every turn—beginning with thunderstorms that backed up flights into New York (where I had meetings) for several hours. Like others in the customer service space, I've developed an acute awareness of queues. My 11-year-old daughter and I were recently waiting for a water slide at a busy resort pool, and I am embarrassed to admit I was doing the mental math: Let's see. 75 seconds per person, 12 people in front of us... this is going to be a 15-minute wait. My prediction was dead-on. My goodness, what am I coming to?! While the water slide incident represented a new low for me, in my defense, I'm seeing many customer-centric organizations quietly and effectively manage (and in some cases, completely rethink) queues to levels of effectiveness that are unprecedented. 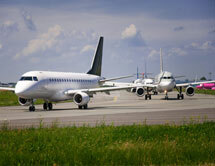 They are upping the ante and impacting customer expectations across the board. I hope you enjoy this issue! They will always be with us. Anytime there is demand for limited resources, there is potential for a queue. There is more science to queues than many realize. With the help of some well-established tools, you can predict to a high level of accuracy wait times and/or resources required. 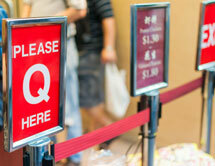 Managing queues well—ensuring your service is fast and easy to access—is smart. Customers reward organizations that respect their time. 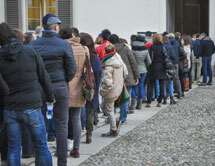 That queues will always be with us in one form or another is probably self-evident; let's spend a minute or two on the science behind them and how innovation is playing out. Predicting wait times for the pool slide was easy—there was a single queue and a fixed transaction time. To shorten waits, you could reduce demand (turn away some customers), shorten transaction time (steepen the descent or reduce travel distance), or add capacity (install another slide). But what about an environment with many more variables—e.g., a busy retail store or a contact center that provides support through many channels? For these scenarios, you'll need a little help from either computer simulation or the widely used queuing formula Erlang C, which can predict wait times for different levels of resources. The following table is an example of tradeoffs—in this case, a call center handling customer interactions. In the example... and let's look at the row with 34 service agents... 65 customers will wait five seconds or longer (there are 250 calls, so we know that most, 185, got answered immediately). In the next five seconds, seven of those customers reach agents, so only 58 customers are waiting 10 seconds or longer. In the next five seconds, six more customers will reach agents, leaving only 52 waiting 15 seconds or more. At this service level, one customer is still waiting at three minutes. 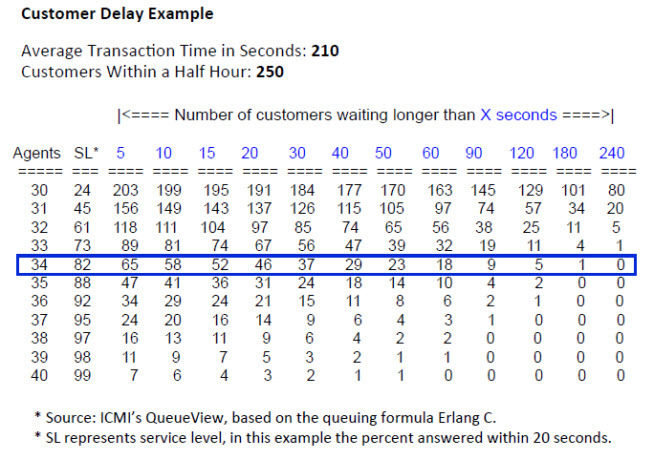 Now look at how many customers are delayed in the row with only 30 service agents—ouch! What a big difference a few people can make! A common area of focus is getting really good at what I think of as blocking and tackling—accurately predicting the ebbs and flows of customer demand (through constantly updated forecasts) and scaling resources to respond. At the Vanguard Group, everyone from the CEO on down helps handle customer contacts when demand is heavy. American Express, Hilton Hotels, JetBlue and others tap into their networks of work-at-home agents. And in busy stores, grocer Whole Foods harnesses a robust approach to queue management that keep waits to a minimum. Another source of innovation utilizes segmentation to ensure high-value customers get priority. Think frequent flyer queues, car rental companies enabling members to go directly to vehicles, and programs such as U.S. Customs' Global Entry, which enables registered customers to bypass customs (or, as the website puts it, "get out of line"—a phrase I'd encourage them to reword). Another approach is to enable customers to use their time as they choose. For example, Disney's "FastPass" tickets give riders a window of time during which they can return to jump to the head of the line—freeing them to do other things. Some restaurants page customers. And Southwest Airlines, British Gas and others give customers the option to get a call back when there is a wait (via a capability called virtual hold or virtual queuing). Some of the most interesting (and disruptive) innovation is in harnessing mobile tools. Uber matches drivers and riders quickly and easily, understandably causing consternation among traditional taxi services. Waze and similar apps started as a navigation tools, but they have evolved into robust time-savers; users identify problems and slowdowns (accidents, construction, etc. ), which fuels the apps' ability to find alternative routes. Here's the message: don't take queues for granted or treat them as just an operational issue. Put some thought into them—both how your organization is managing them and where you could innovate to reduce waits and hassle for your customers. Customers who say they want a transactional relationship in which they receive efficient service (versus 24% who want a friendship, in which they get personalized service). Organizations that report having a social media presence. However, only 39% formally support social media as a customer care channel. Source: ICMI Research, The Normalization of Social Customer Care, 2014. How accurate is your workforce management system/approach in predicting staffing levels? "Just 30 percent of employees in America feel engaged at work, according to a 2013 report by Gallup. Around the world, across 142 countries, the proportion of employees who feel engaged at work is just 13 percent... Demand for our time is increasingly exceeding our capacity—draining us of the energy we need to bring our skill and talent fully to life. Increased competitiveness and a leaner, post-recession work force add to the pressures. The rise of digital technology is perhaps the biggest influence, exposing us to an unprecedented flood of information and requests that we feel compelled to read and respond to at all hours of the day and night." How is customer tolerance evolving? What are your wait times (in customer-facing areas of the business)? How are you measuring them, and who sees the reports? When are they longest? Shortest? What are options for reducing them? What service levels are others in your vertical providing? As a customer, what service levels do your favorite organizations provide (in general)? Overall, what channels and service levels will customers expect a year from now? Two years? Five years? Minneapolis, July 23, 2014 (this was moved from June 12). MWCCA—keynote on the future of customer service, followed by reception. Memphis, September 20, 2014. Full-day seminar, Foundations of the Future Customer Experience Center, for Execs in the Know. Video for Cornell University, For the First Time Ever, the Customer is in Control. Interview, Q&A on Social Media Support. Article, 10 Things Senior Level Managers Must Know About Contact Centers. Video Blog, How to Improve the Accuracy of Your Schedules.